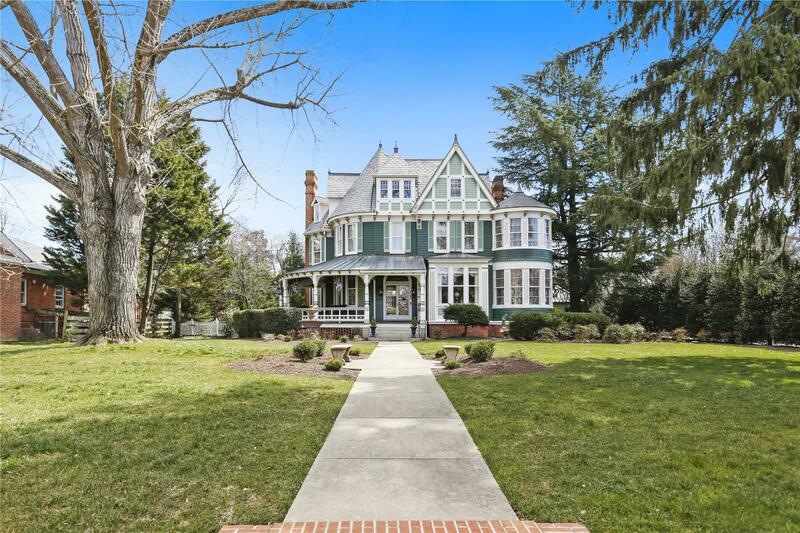 Built in 1893, this beautiful home is described by the Maryland Historic Trust, as one of the most elaborate Victorian buildings in Queen Anne’s County, Maryland. Located on Maryland’s beautiful “Eastern Shore,” it is only a 35 minute drive to Annapolis, MD., and a one hour commute to Washington DC or Baltimore. The house sits upon its original footprint. A huge semicircular porch with copper roof and 2 paddle fans greet you. The 1st floor rooms boast 11’ high ceilings and are separated by large double pocket-doors. Beautiful faux fireplace in the living room. Upstairs is 2 master suites, each with their own beautiful fireplace mantels and period decorations. The master sitting area is situated within the glass turret at the Southern end of the second floor and features original, built-in window seating. Two master baths each have claw foot tubs and heated ceramic tile floors. At the end of the second floor is the original maid’s room, which now serves as a personal gym. The third floor offers additional bedrooms, and a bath. There is a large 4th room on the third floor, that currently being used as an office. The house has a partial basement with a wine cellar. Exterior features include a 4-bay garage, an in-ground heated pool, a beautiful pool house, Koi pond, a fountain, off street parking, and professional landscaping.